Today, November 17th, Franciscans around the world, but especially Secular Franciscans, will celebrate the memory of Saint Elizabeth of Hungary. With St. Louis IX of France, she is Co-Patron Saint of the Secular Franciscan Order. Born in Hungary, in 1207, she went to the German territory of Thuringia, to become the wife of its ruler, Louis. Together they would have four children. She would become well known for her acts of charity to the poor, establishing a hospital for the ill; and food for her poor subjects. Her husband would die from illness, while he was traveling to join an Imperial Crusade to the Holy Land. Court intrigue forced Elizabeth, with some of her children, to abandon the capital city, and flee. In a smaller, poorer city, she took residence and continued her service to the poor. Influenced by the recent arrival of Franciscan friars, she took one of them as her spiritual advisor. She would eventually become a Franciscan penitent. She would also eventually die relatively young. St. Elizabeth can be, in fact, is a counter cultural example for our modern times. With our fascination with the rich and famous. With a minority of people controlling the majority of wealth in our country; to hear of a young, energetic woman willingly give up her riches for the poor, should shake our complacency. How best can we answer Christ’s command to feed the hungry; shelter the homeless; welcome the stranger. And what opportunities have we missed to do so? Through the intercession of St. Elizabeth, may our eyes and hearts be open to those in need. On this evening, October 3rd, throughout the world, members of the Franciscan family, and persons attracted to Francis of Assisi; are gathering in churches, chapels, friaries, monasteries, and convents. We gather to commemorate the passing of a beautiful soul, from this life into eternal life in heaven. We will read the stories of his final days, offer prayers of thanksgiving to God, for the gift of Francis. St. Francis of Assisi, born a cloth merchant’s son, he would become a mystic, an evangelist, a lover of the poor, a lover of God. Through him, people were drawn back to faith, to living the Gospel, the Good News of Jesus Christ. Thousands of men were inspired to follow Francis as members of the Order of Friars Minor; thousands of women joined his disciple, Clare of Assisi, in monastic communities known as the Poor Ladies, later the Poor Clares. And thousands of ordinary people, men and women, farmers and merchants, rich and poor; gathered together as Penitents, under his and his brethren’s guidance. They would become known as the Third Order of St. Francis, later the Secular Franciscan Order. Francis of Assisi, by his life and his words, continues to inspire many Christians to live a deeper commitment to Christ. The story of his life continues to inspire pilgrims to come to Assisi, to visit the places key to life, and to his final resting place. Pax et Bonum! 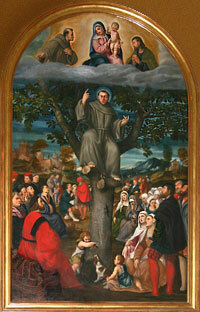 St. Francis of Assisi, and his fellow friars were different from other religious of their day. Rather than remain in monasteries, behind walls; they went out into the city streets, marketplaces, and the highways to bring the Good News to all. 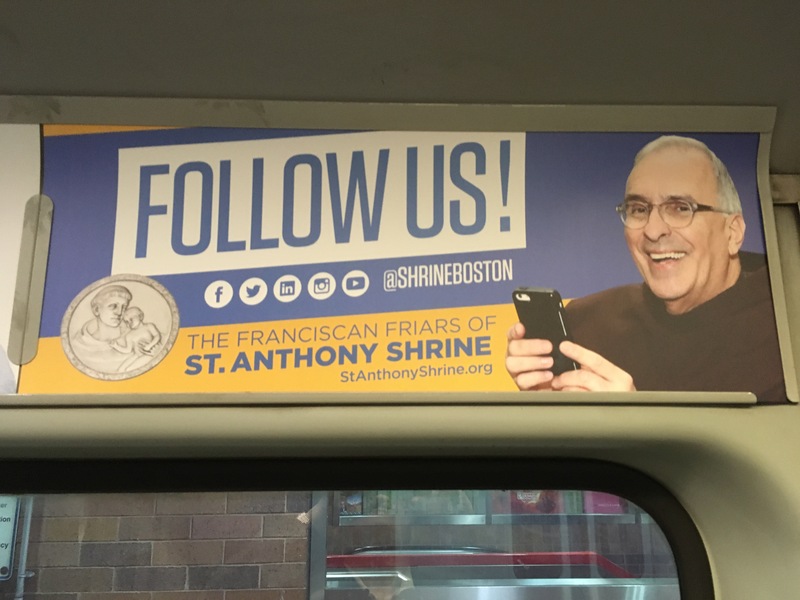 Today, Franciscan friars are still exploring new avenues of reaching out to people. The internet, the Web, and Facebook have become the new electronic highways they travel. 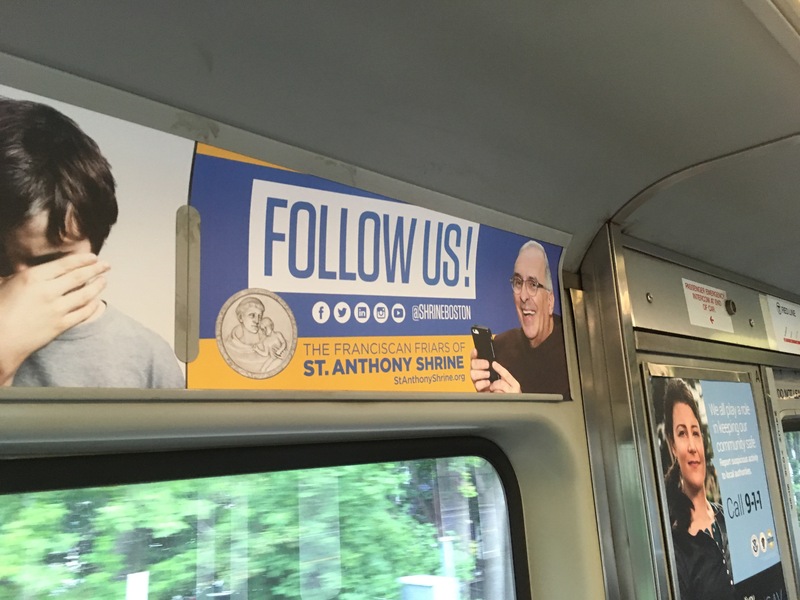 I found this poster on an MBTA Red Line subway car. I know the friar pictured in it, Brother John “Mags.” a wonderful friar. The Good News of Jesus Christ is being proclaimed in many ways, through many new mediums. But, bottom line, it is how each one of us lives the Gospel that provides the best evangelization.